Haber and Menaldo challenge much of the existing literature on regime type and resource reliance. Much of the literature argues that governmental reliance on natural resources is detrimental. It fosters and sustains authoritarianism by providing resources for a government without taxation of, and thus accountability to, its citizens. Reliance on natural resources is also correlated with lower economic growth and civil wars. Haber and Menaldo argue that the literature uses methods that cannot prove that natural resources cause authoritarianism. They argue that time-series data and counterfactual methods are necessary to demonstrate this relationship, if it exists. Haber and Menaldo argue that many studies heretofore compare resource-rich and resource-poor countries and that these studies are fraught with the risk of omitted variable bias. Instead, variation within countries must be studied over time. Haber and Menaldo thus construct an original dataset of 168 countries beginning in 1800, before countries were reliant on natural resources. Haber and Menaldo find no evidence of a resource curse. Instead, they find some evidence of a resource blessing. In one test, Haber and Menaldo examined 53 resource-reliant countries and found that high levels of resource-reliance were correlated with higher levels of democracy. 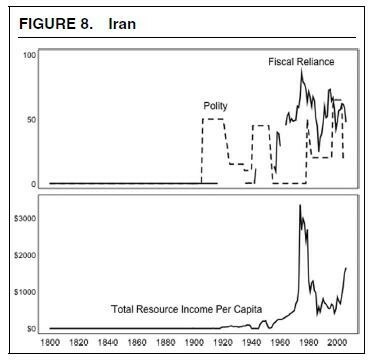 For example, Haber and Menaldo argue that Algeria and Iran became more democratic when those countries were more reliant on natural resources. 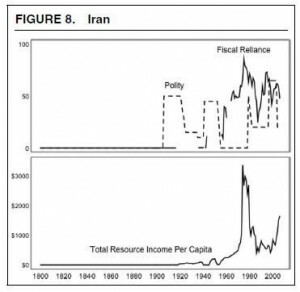 The Shah came to power when Iran had few natural resources, and Iranians mobilized to overthrow the Shah in the 1970s when reliance on oil was at a peak. Furthermore, Haber and Menaldo argue that many countries within the Middle East are neither blessed nor cursed by resources. They argue that authoritarianism in the Middle East pre-dated the discovery of resources, and continued to exist when resource wealth decreased. Moreover, authoritarianism is present in countries in the region that are not resource-rich. They thus argue that natural resource wealth likely does not explain the presence of authoritarianism in the Middle East. This article is an important read for those striving to understand the relationship of natural resource wealth and regime type, in the Middle East and beyond. Download “Do Natural Resources Fuel Authoritarianism? A Reappraisal of the Resource Curse,” from the American Political Science Review if your university has access here or email info@pomeps.org for assistance.